Trellis Netting as Tomato Support for a vigorous and healthy plant. Improve your yields with the proper tomato supporting net. Growing tomatoes can be very rewarding… especially if you happen to catch a market vacuum and are able to surf exorbitant prices per case produced; regardless of the price you are able to fetch you must always have the right tomato support net to make sure your fruits are well aerated and stand above the ground where they could be damaged by humidity and other conditions inducing pathogens! HORTOMALLAS tomato support trellis net allows the plant to grow undisturbed by what would otherwise be a very labor intensive raffia twine fastening work. Tying plants by hand can be, besides expensive, the source of the propagation of pathogens like fungi or viruses as the hands of the field workers become the mechanical vector of the disease. Also the continual disturbance of the plant creates mechanical stress which in many cases lowers the plant´s defense mechanisms as it sends its energies to reposition its leaves to optimize solar exposure rather than producing fruit weight!. Double wall of HORTOMALLAS netting system training tomatoes. 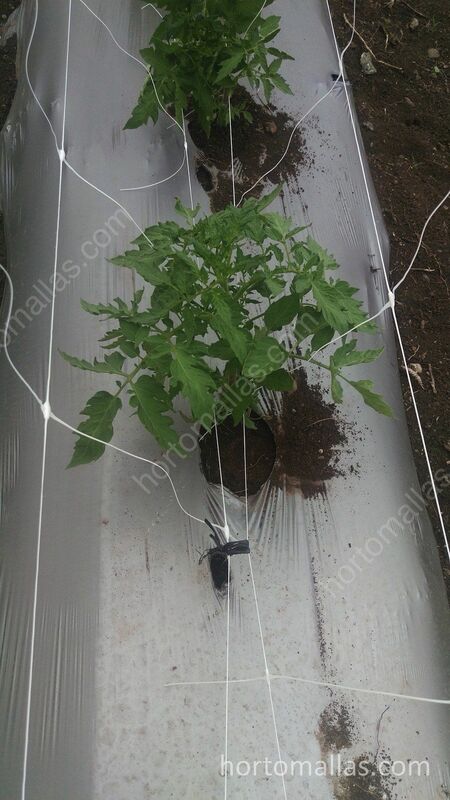 This type of tomato support requires the bottom layer of the netting to be tied as to support the young tomato plant. As the plant grows its new branches will lean over and be held in place by the horizontal lines of the net. 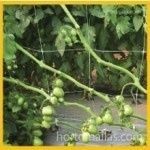 HORTOMALLAS trellis net supports the tomato peduncle. 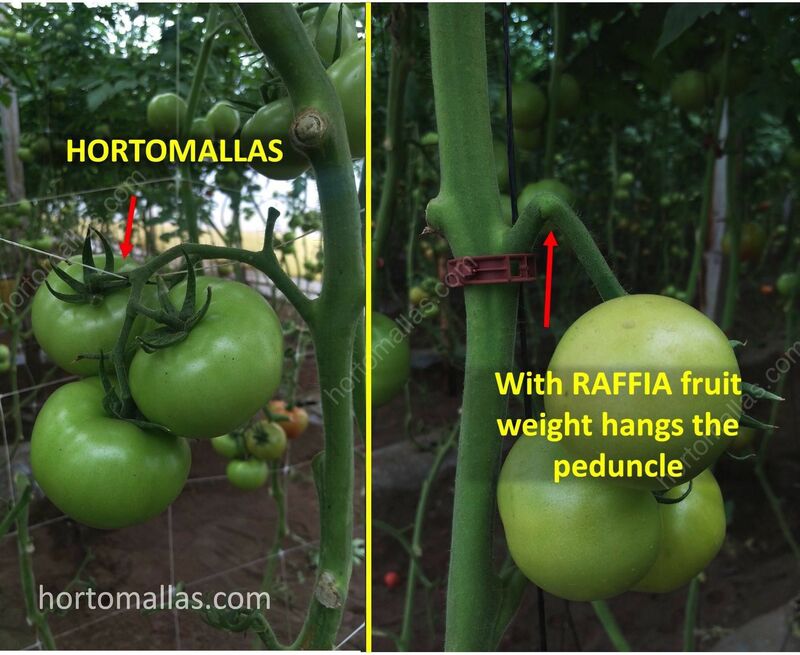 The other advantage of tomatoes support with HORTOMALLAS trellis netting compared to raffia wire is that the meshes of HORTOMALLAS will also act as a support for the tomato bunches by holding the peduncle in the right position and avoiding that the weight of the tomatoes choke the flow of nutrients to the fruit as in these pictures below. HORTOMALLAS supports the tomatoes´peduncle, as compared to raffia twine where the nutrients are choked by the weight of the fruits. The weight of the tomato fruit will choke the peduncle and prevent nutrients from reaching the fruit, condemning it to remain small and of less commercial value. Proper tomato support like tomato trellis netting is necessary to fill fruits. The importance of supporting tomatoes, and the difference between raffia string, tomato stakes and tomato trellises. The proper system of support for tomatoes will yield greater production tonnage as well as larger and more filled tomatoes. Plant mechanical stress can be an invisible enemy to deal with when tutoring plants that need vertical support. As we prune a plant we clear volume and allow better sunlight exposure to penetrate the bush. Pruning is an action that can be harmful as the exposed vegetative tissues can be easily attacked by pathogens, so a clear and clean cut is a must in order to grow a healthy tomato plant. Training tomatoes is also very necessary, as tomato net for support will aid the plant keeping it away from the ground (and its humidity) and improving aeration. Although beneficial tomato-support can present some unintended consequences as stressing the plant by extreme touching and rearranging of the leaf system. Plants are efficient organisms that arrange their leaves to maximize solar exposure and use of nutrients. Every time we manually (mechanically) move the plant around we force it to find its new optimum point and angle of leaf exposure; as the plant strides to rearrange itself, it stops filling fruits as its energies and resources are being diverted towards maximizing photosynthetic capabilities. How netting for tomato support increases yields. This “down time” caused by the action of supporting the tomato plant, will cost the grower between 8 and 10% in yields. By finding a way to tutor tomatoes in a way that reduces hand to plant contact you will increase your output. Tomato stakes and raffia twine will require too much interaction with the plant and the operators, so trellising passively each side of the furrow with two rows of tomato trellis nets will avoid the need to arrange the plant, and allow the tomato branches to lean passively and naturally on the netting for tomato support.